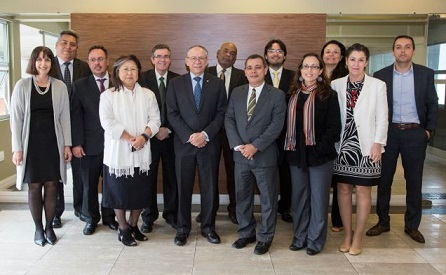 The VII Session of the Advisory Committee (AC) of the Latin American and Caribbean Center on Health Sciences Information (BIREME) took place on November 7 and 8, 2018. The main role of the AC, according to BIREME Statute in the context of its new institutional framework (CD49.R5), is to make recommendations to PAHO/WHO Director on the subject of programmatic functions, based on the PAHO/WHO Strategic Plan, the Biannual Work Plan, and recommendations of the Scientific Committee. The AC, according to CD54.R5 and CSP29.R9 resolutions, is currently composed of representatives from Brazil and PAHO (permanent members), Argentina (2016-2018), Jamaica (2016-2018), Peru (2016-2018), Barbados (2018-2020) and El Salvador (2018-2020). The program was marked by discussions revolving around three thematic axes: (1) History and Institutionality; (2) Financial Sustainability; and (3) Technical Cooperation. All participants provided strategic and technical information, knowledge and recommendations. A final report, agreed upon by all members and participants, will be presented to the PAHO/WHO Director within 30 days. The Interim Director of the Department of Evidence and Intelligence for Action in Health (EIH), Dr. Francisco Becerra, also participated at the VII AC Session. The Director of BIREME, Dr. Diego González, led the session, with the support of the Center’s managers. After the opening of the meeting by Dr. González and Dr. Becerra and an inaugural presentation of the Center by its Director, it was agreed upon that the Director and managers would answer the questions referent to their previous presentations on the 8th as well as considering BIREME’s Executive Report, which had previously been shared with the Advisory Committee members. The members from Argentina, Marcelo Barbieri, and El Salvador, Nádia Rodríguez, were assigned as president and raporteur of the session, respectively. The presentations began with the Director of BIREME, who informed about the “BIREME’s current institutional situation and the fulfillment of recommendations from the VI AC Meeting 2017”. Next, Silvia de Valentin, Administrator, presented aspects related to BIREME’s financial sustainability, the context of the PAHO/WHO Strategic Plan 2014-2019 and the Initiatives, Products and Services approved and under development in BIREME’s Biannual Work Plan (BWP) 2018-2019. Considering the importance of BIREME’s Information Technology Infrastructure (ITI) for the effectiveness of its technical cooperation on information access by the countries of the Region, Marcia Barretto, ITI Coordinator, mentioned the contributions of local and international institutions in the subsidy of Internet and Data Center costs. Verônica Abdala, Manager of Services and Information Sources (SCI), presented the sources of scientific information and evidence that characterize BIREME’s technical cooperation in Latin America and the Caribbean, as well as in other Regions. She emphasized networking as an essential means of bringing the priorities of the countries of the Region to the actions proposed by the Center. Next, Renato Murasaki, Methodology and Technology Manager (MTI), presented new developments that bring feasibility and support to information technology products and services for technical cooperation, as well as innovating developments in services and information applications for health professionals. Dr. Lilian Calò, Coordinator of Scientific Communication and Institutional Communication, presented initiatives in scientific communication developed by BIREME and actions of internal and external communication for disseminating BIREME’s actions in the fulfillment of its mission and objectives. The members of the AC participated actively of the presentations, bringing forward questions, suggestions and recommendations. According to Marcelo Barbieri, the BIREME team “responded to each and every one of the questions and issues brought up with detailed information and data to support each statement […] we are fully satisfied with the explanations delivered”. 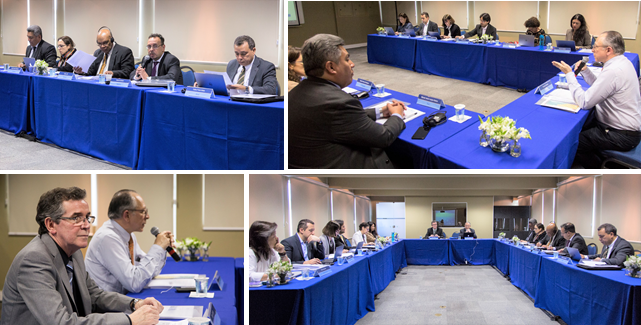 [Brazil] Galba Freire Moita [General Coordinator of Monitoring and Evaluation, Ministry of Health] pointed out the historical partnership between BIREME and the Ministry of Health and recommended searching for alliances with other departments of the Ministry besides de CGDI/SE. He pointed out that the moment of government transition that Brazil is facing may be favorable for searching for projects that focus on impacting results, information for decision-making and measurable products. [Barbados] Danny Gil [Director of Politics and Research Planning, Ministry of Health and Well-Being] ratified the recommendations of the VI to increase and diversify the sources of financing for BIREME by proposing projects with Development Agencies and PAHO/WHO member countries. The third recommendation, in fact, is a commitment made by all members of the AC of becoming “BIREME ambassadors”, that is, to diffuse the Center’s products, services, projects and potentials in their countries. [El Salvador] Nádia Rodríguez [Coordinator of the Department of Health Research, National Institute of Health, Ministry of Health] commented that BIREME could delegate some tasks to the network in order to focus on strategic actions and the development of new products and services. [Peru] Manuel Loayza Alarico [Executive Deputy Director of the National Center for Epidemiology, Prevention and Disease Control, Ministry of Health], in consonance with the other members, remarked that BIREME’s priority projects can be promoted in the context of a resource mobilization plan for the Center. At the end of the meeting, Marcelo Barbieri thanked all members of the AC for their presence, as well as BIREME for hosting the meeting, emphasizing the quality of the presentations and discussions and the organization of the event. Dr. González declared the VII Session of the AC closed, thanked the Committee and recognized the work of all BIREME collaborators in obtaining the results presented under the leadership of the managers.